One of the most ludicrous—and debunked—claims of the far right is that the mainstream media in the United States has an inherent liberal/progressive bias. But Noam Chomsky tore that claim apart in his 1988 book, “Manufacturing Consent: The Political Economy of the Mass Media” (which he co-wrote with the late economist/media scholar Edward S. Herman). The real media bias, Chomsky stressed, was a corporate bias dictated by advertising and soundbites. And 30 years later, the 90-year-old Chomsky revisited his book during a recent interview with Al Jazeera English. 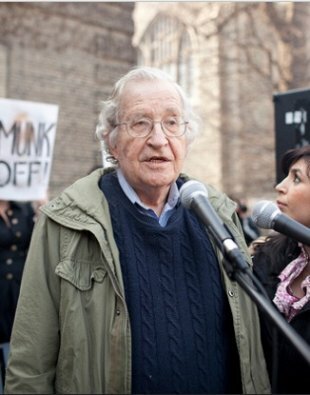 Chomsky described social media outlets like Facebook as “double-edged,” noting, “Sometimes, they are used for constructive purposes. But they have also become major forces for undermining democracy.” Chomsky cited Brazil as an example, noting how effectively the far-right Jair Bolsonaro used social media to win Brazil’s presidential election this year.